« The ArbotiX-M is here! Erik Sofge over at the Zero Moment blog has a great post about Patent #2058306 – the first U.S Patent to use the word ‘Robot’. 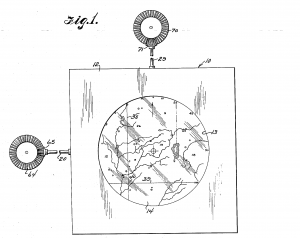 Erik’s post gives us some insight into the nature of the patent (a navigational system something akin to a retro GPS system) as well as some information about a much earlier “teleautomation” patent by none other than Nikola Tesla. This entry was posted on Tuesday, October 15th, 2013 at 9:30 am	and is filed under Front Page News, Misc. You can follow any responses to this entry through the RSS 2.0 feed. You can leave a response, or trackback from your own site.